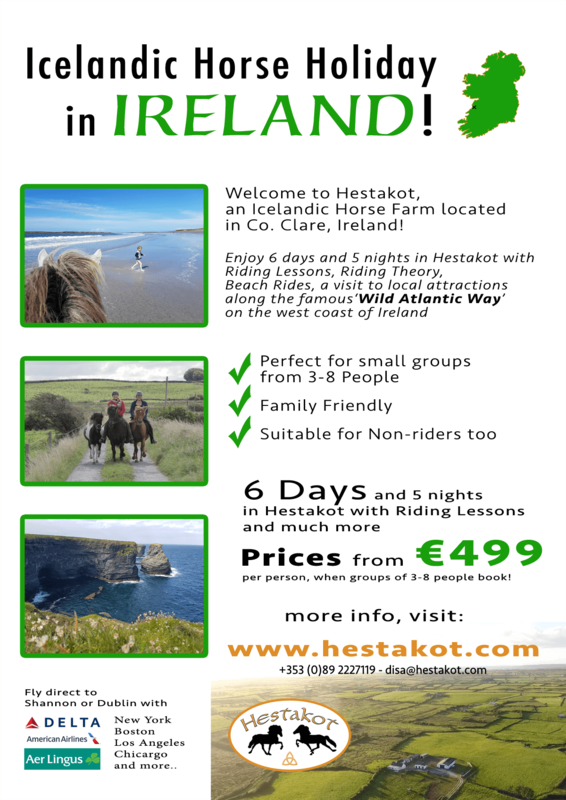 ICELANDIC HORSE HOLIDAY IN IRELAND! 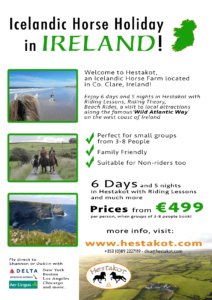 The Icelandic Horse Farm Hestakot in Co.Clare, Ireland, would like to welcome you! 6 days and 5 nights in Hestakot with riding lessons, horse riding lessons, beach walks and trips to the famous ‘Wild Atlantic Way’ on the nearby west coast of Ireland. There are loads of Irish pubs in the area with plenty of traditional and contemporary music ! €499 per person when 6-8 guests booking together. Excursions: 2 afternoons and one day excursion. The group is picked up from Shannon Airport or from Dublin upon request. A special request? – on request almost everything can be arranged!